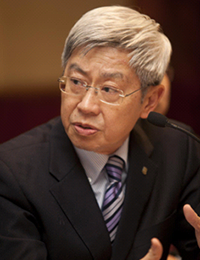 Professor Cheng was Dean of Education, Pro-Vice-Chancellor and Senior Advisor to the Vice-Chancellor of the University. Trained as a mathematician, he was a school teacher in Physics and Mathematics, and became a principal before he pursued doctoral study at the London Institute of Education. He taught at the Harvard Graduate School of Education as a Visiting Professor from 1996 to 2006. He has been a consultant with the World Bank, UNESCO, UNICEF, UNDP and the Asian Development Bank. His research areas mainly focus on education policy and planning. He has undertaken various projects related to policy-making, legislation and institutional evaluation in various jurisdictions across continents. Recently, he has been involved in discussions about education refroms in the U.S. In addition, he is a member of the National Advisory Committee on Curriculum Reform in China. Locally, he is member of the Education Commission and was instrumental in the comprehensive refrom which started in 1999 and is still on-going.